And therefore I looked down into the great pity of a person’s life on this earth. I don’t mean that we all end up dead, that’s not the great pity. I mean that he couldn’t tell me what he was dreaming, and I couldn’t tell him what was real. 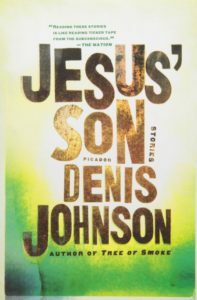 “Denis Johnson’s Jesus’ Son is his fifth book of fiction, the previous four being novels with similar preoccupations: loveless promiscuity, the abuse of narcotics and alcohol, the debilitating effects of parental neglect and the sometimes violent paradoxes inherent in the Christian notions of salvation and self-sacrifice. 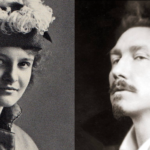 His prose, especially in this book and in the novels Angels and Resuscitation of a Hanged Man, consistently generates imagery of ferocious intensity, much of it shaded with a menacing, even deranged sense of humor. No American novelist since William Burroughs has so flagrantly risked ‘insensitivity’ in an effort to depict the pathology of addiction. 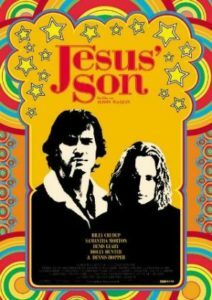 In nearly every respect Jesus’ Son can be more accurately described as a novel than as a collection of stories. 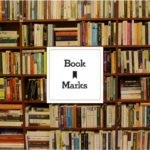 The same unnamed young drifter narrates each of the book’s 11 chapterlike sections, only six or seven of which can stand as discrete, coherent short stories; each is most fully understood in the context of earlier or subsequent sections. The narrator also makes distinctly novelistic progress as he staggers from habit to addiction—passively participating along the way in abortions and car crashes, drug deals and murder—and then toward the first stages of a highly tentative recovery. The narrator’s inability to construct a ‘well-made’ story, or even to keep the facts of his life straight, expressively parallels the rest of his dysfunctional behavior. In this and in other aspects he is a younger version of Samuel Beckett’s monologuists, who continually fail to execute their often-restated narrative plans, and who tend to feel profoundly ambivalent about the women in their lives, particularly their mothers. There are further similarities, in the focus on physical maladies and failure shared by characters in Mr. Johnson’s and Beckett’s works and in the trapdoor cadences and self-deprecating humor of their sentences. 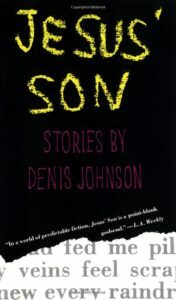 After lying to impress a girlfriend, Mr. Johnson’s narrator admits, ‘Nothing I could think up, no matter how dramatic or completely horrible, ever made her repent or love me the way she had at first, before she really knew me.’ In his dependence on heroin and illegal sources of income, he also is cousin to Bobby, the hapless but sympathetic young burglar in David Mamet’s American Buffalo. In the end he realizes, as Bobby does, that he’s probably better off spending some time in a hospital. The narrator, overcome by nostalgia triggered by seeing the red-haired women (or woman), travels back through moments spent with various girlfriends or his wife, to his earliest days with his mother, a period we infer has contributed significantly to his current psychoses. That inference gains support when he gets back to a place called the Vine, where he is delighted to discover his favorite person tending bar, a woman he refers to as ‘Nurse’: ‘She poured doubles like an angel, right up to the lip of a cocktail glass. . . .You had to go down to them like a hummingbird over a blossom.’ In profound, sobbing gratitude for her generosity in quenching his thirst, he silently declares: ‘I’ll never forget you. Your husband will beat you with an extension cord and the bus will pull away leaving you standing there in tears, but you were my mother.’ In the narrator’s bewildered but subconsciously percipient mind, Mr. Johnson has allowed a telling conflation—of mother, suckler, angel, destroyer — and a penetrating glimpse into the chaotic roots of addiction. ‘Talk into here,’ Bill replies, pointing to a scar on his cheek. Such exchanges succinctly express Mr. Johnson’s compassion and skepticism. His characters’ damaged psyches keep the reader off balance, unable to avoid either wincing sympathetically or snorting with laughter. 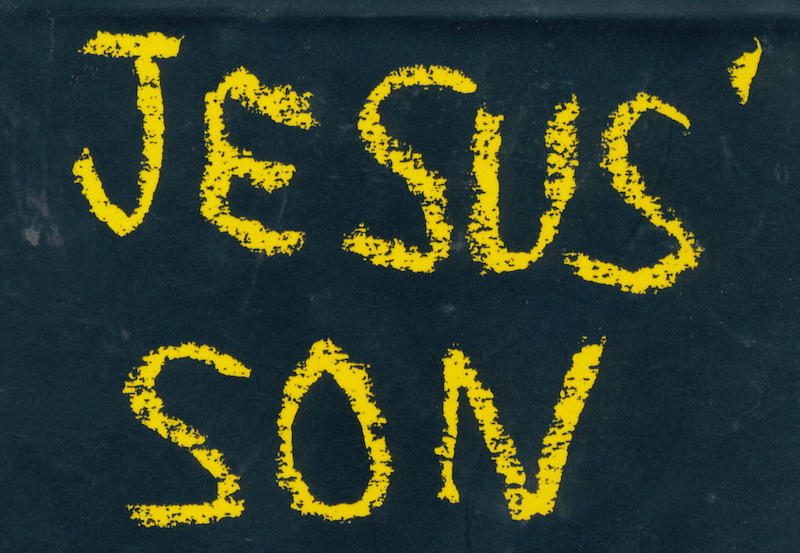 Jesus’ Son contains dozens of equally hilarious and unsettling passages.